Comment: Peter has had his ups and downs as a disciple, but one thing he can claim for sure is that he has always followed the rules about “clean and unclean”. So when he has a vision from God instructing him to eat what is “unclean”, he protests at first, until God says “What God has made clean, you must not call profane”. Peter realizes he needs to adjust his thinking and expand his vision. Later on, he realizes the deeper meaning of this vision—that it’s not just about animals or about eating, but also about who will receive the Holy Spirit and baptism. Peter needed to adjust his thinking and expand his vision with regard to welcoming Gentiles to the way of Jesus Christ. In The Wall In the Middle of the Book, a tiny knight is glad to have an enormous wall in the middle of the book. 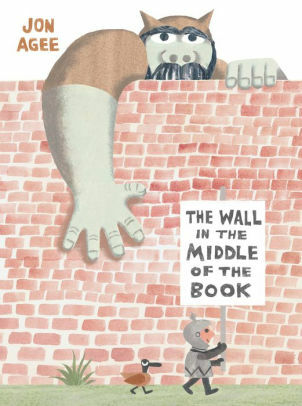 The wall, he is sure, protects him from all the things that are on the other side of the wall: rhinos and tigers and a giant ogre who will eat him up! He wants that wall to remain intact, to remain separate from those terrible things on the other side. But then, his side of the wall begins to flood, filling up with water. The little knight is in danger of drowning, until a large hand reaches over and pulls him to the other side of the wall. At first, he is horrified—the terrible ogre is the one who pulled him over the wall! But when he voices this fear, the ogre starts to laugh, surprised he could be so afraid, and offers to show him around the other side of the wall, along with all the not-so-scary creatures on that side. At first, the knight is hesitant, but then asks the ogre to wait so he can see what is on this side of the wall. The little knight thought the wall was keeping out terrible things, but he needed to adjust his thinking and expand his vision, like Peter. For both Peter and the knight, they had kept to the limitations until those limitations didn’t work anymore. Then they realized that on the other side of those limitations were some very good things! We may have grown so used to the rules we follow, the walls we’ve built, that we’ve missed what’s on the other side. With God’s help, we’ll be able to adjust our thinking and expand our vision, to see what’s on the other side, and follow the Holy Spirit to new places and new people. Lectionary Links (NL): May 5, 2019 by Storypath is licensed under a Creative Commons Attribution-NonCommercial 4.0 International License.